Cyber Monday CD Spcials - $5 and free shipping. I've seen a lot of talk on the interwebs today about Cyber Monday specials not actually being very good deals. So here's a good deal for you: my full-length albums are only $5 each and FREE SHIPPING (in the US). How's that for buying local/independent? Happy shopping! 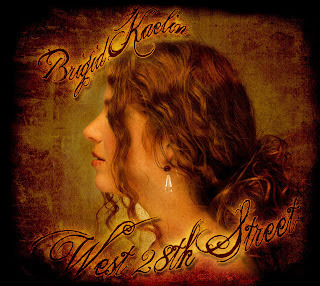 Check out www.brigidkaelin.com or http://brigidkaelin.bandcamp.com to see track listings and more details. Or just click below to add to your paypal carts. West 28th Street featuring "One More Last Kiss" and "You Make Me Wanna Go to Church"
Keep Your Secrets -- featuring "Ballad of Motorcycle Joe" and "Future Mr. Used-to-Be"
Just a cute baby picture, that's all. Aaaaaaaaaaaaaaaand, we're back! Over the past year, we made a lot of really great friends in Scotland, and there was a week of teary goodbyes before leaving. It was sad to go -- probably more sad than when we left Louisville last summer. You see, leaving Louisville was okay because we knew we'd be back someday. And while I know we'll return to Edinburgh someday, I doubt it will ever be as long-term as it was this past year. We would have loved to have stayed, but work visas for non-EU citizens are hard to come by these days. I also felt a bit guilty keeping the grandchild an ocean away. So ... hello, Louisville! It's nice to see you. I'm going to post a few baby pics today because otherwise I'd rant and rave about how much I miss the NHS and how horrible the American health care system (that for some reason, many of you believe to be the "best in the world") is, especially when it comes to maternal and infant care. Well, there I go starting my rant ... I'll save controversy for another blog. Instead, here are pics! Before there was the Alamo. Before there was 9/11. Before there were many other events that we must all remember, there was Guy Fawkes Day. King James I survived, of course, and Scots know him better as King James VI. You see, he became King of England in 1603 when Queen Elizabeth died child-free (not child-less -- there is a difference). But he became King James VI of Scotland when he was a mere thirteen months old, after his mother, Mary Queen of Scots, was forced to abdicate. Mary Queen of Scots became Queen of Scotland when she was a mere five (or six) days old. My wee boy, Graham, had his passport pictures taken when he was a mere five (or six) days old. We are using that brand new passport to take wee Graham back to the USA. How's that for a history lesson? Don't get too excited though. We booked a round-trip, just in case the crazies win. They won't, though, so get used to having me in your time zone, America.